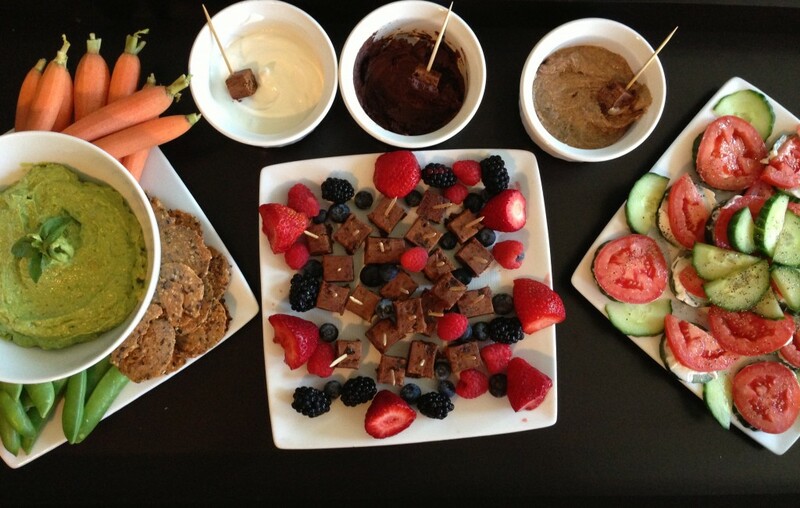 This end of summer/welcome to fall party menu is all about dipping! I love dips, you can't go wrong! 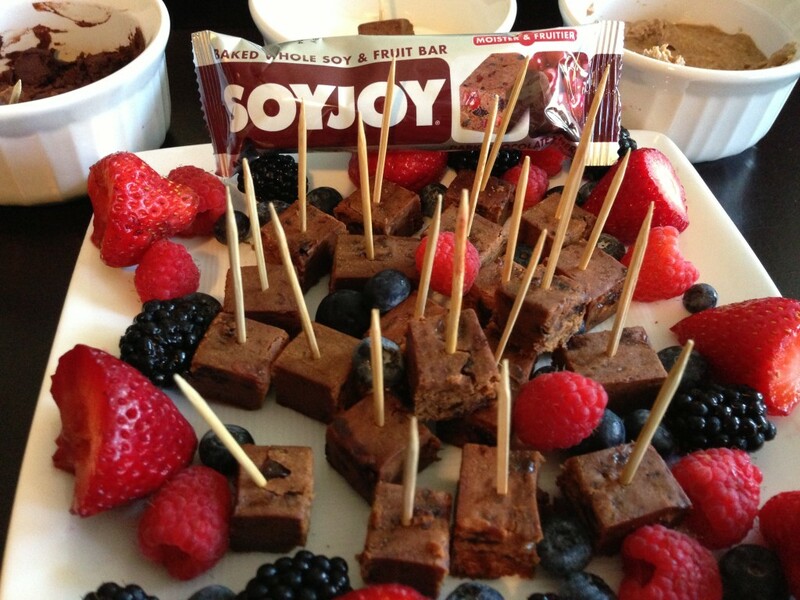 1) Slice a Dark Chocolate Cherry SOYJOY into bite size pieces and lay them on a plate with assorted berries. 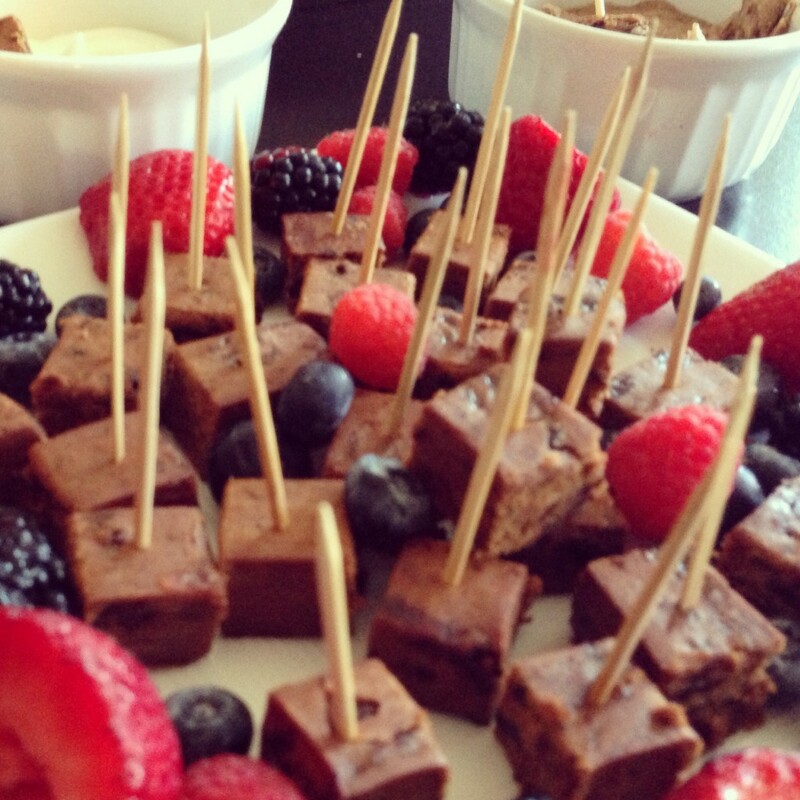 Put toothpicks in each bite so that they're easy to grab for your guests, and to make it easy to dip! Yep, I said dip. These Dark Chocolate Cherry SOYJOY bites you've just created are great dipped in Greek yogurt, melted dark chocolate, and/or almond butter. Dip & enjoy!! *To add some flavor to your Greek Yogurt you can add a little honey, cinnamon, or stevia. Remember, a little goes a long way! 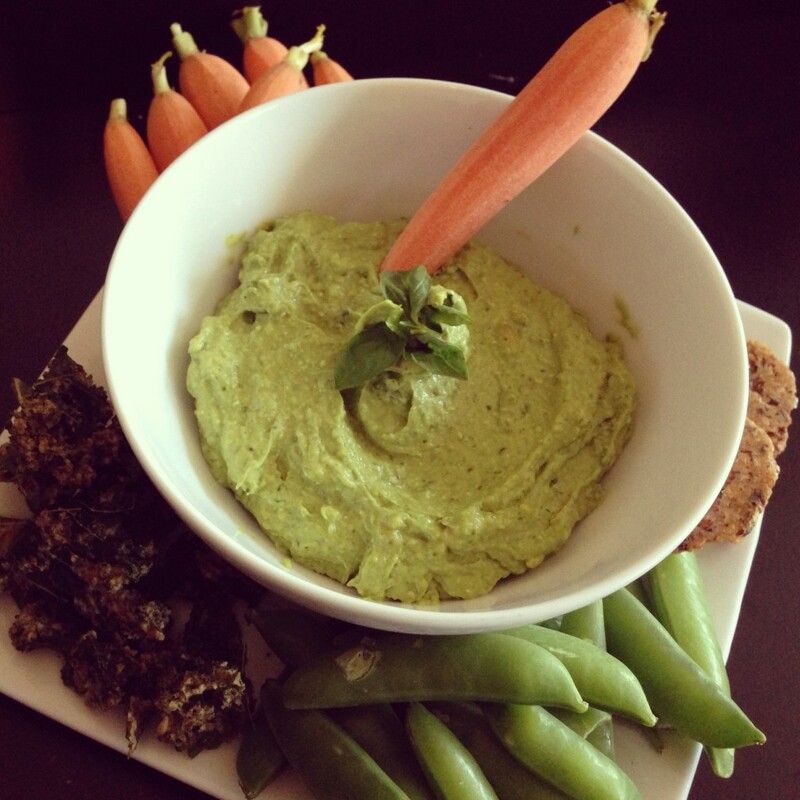 2) Whip up some of my Gluten Free Avocado Pesto Dip and serve with veggies, like carrots and snap peas, gluten-free crackers, or kale chips. *This Avocado Pesto Dip is usually a sauce that I use for pasta dishes, but I'm obsessed with using it as a dip for all kinds of things, I think you will be too! 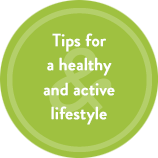 3) Slice up a cucumber and roma tomato and make some Cucumber Tomato Bites. 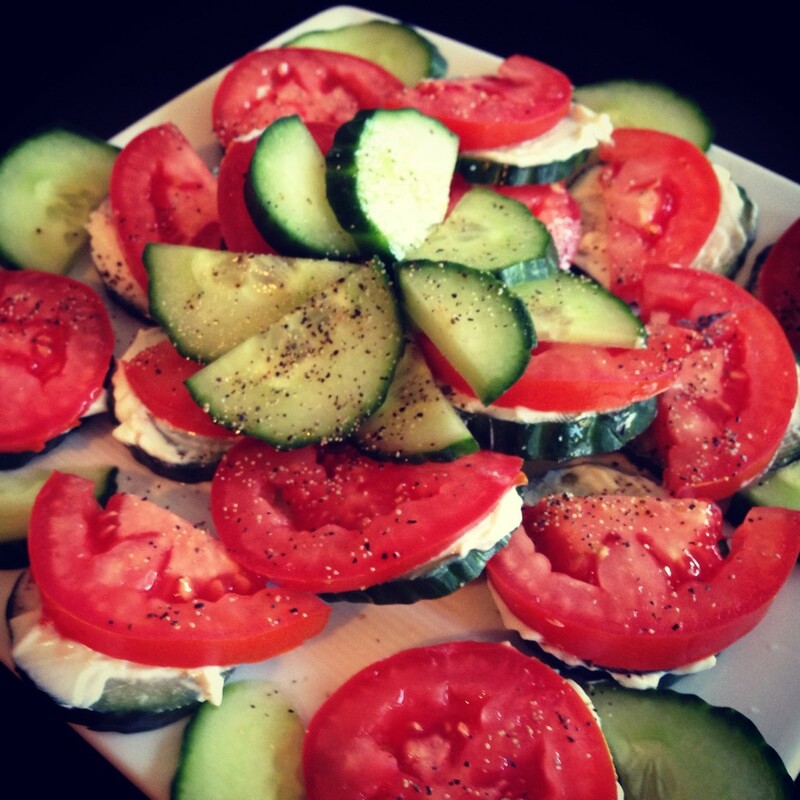 Place cucumbers on a plate, spread a spreadable goat cheese or whipped cream cheese and top with a slice of tomato. Sprinkle each bite with pepper and sea salt (or my favorite, Himalayan pink salt) and enjoy every single colorful bite! *A little goes a long way with the salt & pepper. 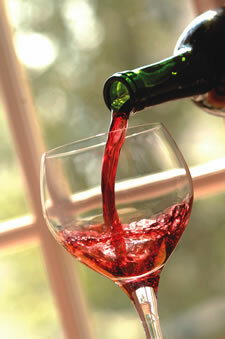 4) No party is complete without wine or beer! Try serving the newest gluten-free beer or cider options! I'm off to get my beverages right now for my little evening I have planned with a few of my close girlfriends! There's always a good reason to gather with your friends, and there is certainly no reason my gluten free friends should ever go hungry! If you're not gluten free, but hosting someone that is, make it easy for yourself and serve everything gluten free, it leaves no question for anyone. Just take these four tips from above and cheers away! Disclaimer: I am an official brand ambassador for SOYJOY. While I receive compensation for my participation as a brand ambassador, opinions are all my own. Love this! These are some great ideas!! Thanks Tenley!